Anne of Green Gables was written by Lucy Maud Montgomery in 1908. It is the first in a series of books about the beloved character, Anne Shirley. The series is comprised of eight books: Anne of Green Gables , Anne of Avonlea, Anne of the Island, Anne of Windy Poplars, Anne's House of Dreams, Anne of Ingleside, Rainbow Valley, and Rilla of Ingleside. 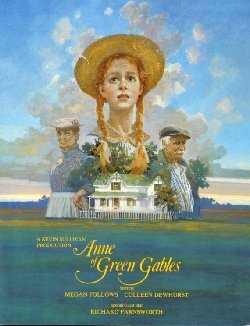 There have been a few film adaptations of Anne of Green Gables over the years, but none can compare to the Kevin Sullivan production (1985), which is known for being most true to the original book. Anne of Green Gables was filmed in Canada, on Prince Edward Island (less than 5%!!) and in Southern Ontario (much or it at The Westfield Heritage Centre). Megan Follows and Schuyler Grant. The film did so well that Kevin Sullivan and crew decided to continue the story. In 1987, Anne of Green Gables--the Sequel (renamed Anne of Avonlea in the United States) was released. To the surprise of many, this film was not nearly as true to book as its predecessor was. Nonetheless, it is a fine and wonderful piece of work. Kevin Sullivan's two Anne of Green Gables films acquired quite a bit of a following, and everyone wanted to see more. In 1998, Sullivan heard their cry and Anne of Green Gables: The Continuing Story was born. The film aired in Australia (July 1999) and Taiwan (December 1999) before premiering in Canada in April 2000. Anne fans in the United States who were without satellite connections had to wait until July 2000 to see it. The ensuing uproar over the storyline was heard around the globe. There are many who were so disappointed with the film that they wish they'd never seen it! The three biggest complaints were that (1) the movie strayed too much from the books, (2) the timeline was completely out of joint, and (3) Anne was not herself. But then, there are many who maintain that the movie is wonderful, and they are quite vocal in their defense of the film. However, no matter what everyone thinks of the third installment, one thing is certain: everyone is aching for a fourth installment. For now, however, there is none planned. Since the first two Anne of Green Gables films came out, Kevin Sullivan has been producing many other wholesome films and television series. You are probably familar with the critically acclaimed Road to Avonlea series which ran as Avonlea on the Disney Channel in the United States. 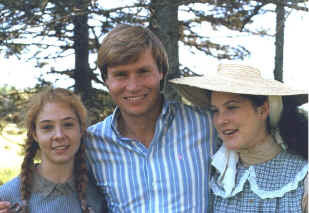 The show, which was based on other books by L. M. Montgomery including Chronicles of Avonlea, ran for 7 seasons (1990-1997) and its cast included quite a few cast members from the Anne films. Sullivan has also produced such wonderful films as Looking for Miracles (1989), Lantern Hill (1990), By Way of the Stars (1992), Under the Piano (1995), with Megan Follows, Butterbox Babies (1995), Promise the Moon (1997), Seasons of Love (1998), Happy Christmas, Miss King (1998), and The Piano Man's Daughter (2000). Also, Sullivan's other series, Wind at My Back, about a small mining town in Ontario, Canada struggling through the 1930s Depression era, is now in its fifth season on CBC. Visit the Kevin Sullivan site to find out what's playing now. 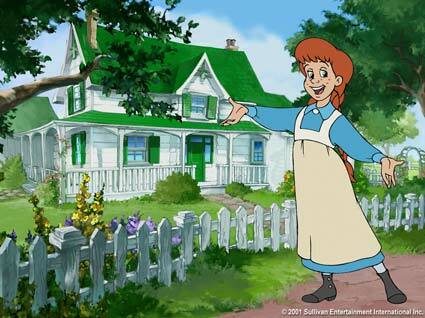 Kevin Sullivan is now producing Anne, The Animated Series which is based on the Anne of Green Gables books! Actually, there had already been at least one animated series made based on the books. One, directed by Takahata Isao, ran for 50 episodes in 1979. Takahata later edited the first six episodes into a film, which was released in 1990. The Kevin Sullivan production premiered on TVO (Canada) and PBS (United States) in September 2001.